The Lincoln Memorial stands at the west end of the National Mall as a neoclassical monument to the 16th President. The memorial, designed by Henry Bacon, after ancient Greek temples, stands 190 feet long, 119 feet wide, and almost 100 feet high. 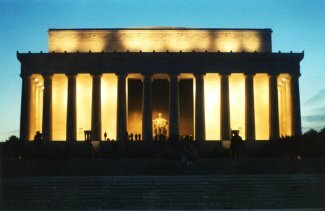 It is surrounded by a peristyle of 38 fluted Doric columns, one for each of the thirty six states in the Union at the time of Lincoln's death, and two columns in-antis at the entrance behind the colonnade. The north and south side chambers contain carved inscriptions of Lincoln's Second Inaugural Address and his Gettysburg Address. Lying between the north and south chambers is the central hall containing the solitary figure of Lincoln sitting in contemplation. The statue was carved in four years by the Piccirilli brothers under the supervision of the sculptor, Daniel Chester French. The statue of Lincoln is 19 feet high and weighs 175 tons. The original plan was for the statue to be only ten feet high, but this was changed so that the figure of Lincoln would not be dwarfed by the size of the chamber. A commission to plan a monument was first proposed in 1867, shortly after Lincoln's death. The design for that plan called for six equestrian and 31 pedestrian statues of colossal size, with a 12-foot statue of Lincoln in the center. That project was never started for lack of funds. Congress approved the bill to construct this memorial in 1910. Construction began in 1914, and the memorial was opened to the public in 1922. The Memorial is visited by millions of visitors each year and is the site of many large public gatherings and protests. Martin Luther King, Jr. delivered his famous "I Have a Dream" speech to a crowd by the Lincoln Memorial in 1963 . Damaged over the years by heavy visitation and environmental factors, the Lincoln Memorial is currently undergoing a major restoration.